The last note of her signature song hung in the cavernous space like the echo of a songbird … and Grace Meredith knew she’d “stuck it.” Like those agile Olympic gymnasts on their flying dismounts from the uneven bars or balance beam. The final moment, a breathless hush … and then beyond the lights, applause thundering from the front-row seats clear up to the balcony. In spite of the sore throat she’d been battling all week. With a smile, a wave, and a few kisses thrown to her excited fans, Grace backed gracefully off the stage of the huge Nashville auditorium, her royal-blue chiffon dress fluttering after her until the heavy, red stage curtains hid the audience from sight. Grace nodded, grateful for her assistant’s firm grip on her elbow as they threaded their way over electrical cords, around ladders and props, and down the stairs to the dressing rooms. “Thanks, Sam,” she breathed, sinking into the padded lounge chair. “I just need a few minutes.” Hopefully, merchandise sales in the lobby were going well. It was going to be tight meeting all the expenses from this New Year, New You tour—her first independent tour—but sales of her new CD always seemed to skyrocket after that last song. Sam poured a cup of hot tea from a thermos into a mug and handed it to her. Grace had been drinking honey-lemon tea and sucking Slippery Elm Lozenges like an addict just to keep her throat from giving out. She sipped the hot, sweet liquid, sighed, and closed her eyes. Grace caught a glimpse of the two of them in the dressing room mirror as Sam ushered her out the door and smiled at the contrasts. Her own pale face and amber eyes, perked up with artfully applied eyeliner and peachy makeup, were framed by layered lengths of rich brunette hair creating a casual shag that hung past her shoulders. Samantha had honey-brown skin, large dark eyes, and tiny black twists all over her head. She looked “cute as a button,” as Grace’s mother would say. But looks weren’t the only differences between them. Samantha had the more outgoing personality, the chutzpah Grace wished she could muster in everyday life. Only when she walked onto the stage did Grace feel the certainty, the boldness, that enabled her to “sing her guts out”—as one reviewer had described her performance—and speak confidently to her thousands of young fans about the virtues of waiting till marriage for physical intimacy. She was at home on the stage—and at the meet and greet time she always scheduled afterward. Like now, as twenty randomly selected fans gathered in a lounge to meet their favorite contemporary Christian music artist. Grace took time to speak to each one, asking about school or friends or favorite activities. And answering the inevitable question asked by her female fans, usually accompanied by self-conscious giggles: “Miss Grace, do you have a picture of your fiancé?” To which she happily showed a little “brag book” of photos of Roger Baldwin, the love of her life, including pictures of the two of them, laughing, holding hands—one of which also included Oreo, her black-and-white cat, cuddled in her arms. Prodded by starry-eyed teenagers, she would then make a show of modeling the silver princess-cut diamond engagement ring with the tiny rubies Roger had slipped on her finger the previous year. “I love your song!” … “Can my friend take our picture?” … “Are you going to sing at your own wedding?” Grace laughed at the fun questions, ready with easy banter. Grace cleared her throat. That “just like you” thing always made her uncomfortable. She opened her mouth to say, “Oh, sweetheart, don’t be like anybody else, just be yourself”—but the girl had already scurried away. Grace swallowed the words and turned to the next fan eagerly waving a CD for her to sign. As the room emptied, Grace realized just how tired she was. It had been a particularly grueling tour—nearly four weeks through six southern states. Many of the concerts had been scheduled back to back, which meant travelling at night in a chartered tour bus with her small band of dedicated musicians, singing to packed houses four or five times a week—and that wasn’t counting the Sunday morning performances in various churches. Touring had always been exhausting, but without the support of a record label, she was doing twice the work, and feeling every bit of it at the end of the day. Hopefully the band had already broken down the set and was loading the tour bus so they could get on the road soon. They were heading for Memphis tonight, where she and Sam would be able to stay in a hotel. Just two more concerts left in her New Year, New You January tour, and then home to Chicago for a much-needed break. And to see Roger. She could hardly wait. Half an hour later, Grace collapsed on the queen-size bed in the private compartment at the back of the tour bus and took out her cell phone. Roger usually waited up for her call, though sometimes it went to voice mail and she had to wait till the next day for his return call. Like last night. There’d been no answer, and she hadn’t heard from him today either. He must’ve had a busy day at work … though she wasn’t sure why a financial consultant with a prestigious Chicago firm couldn’t find ten minutes to return her call. Yeah, yeah. She knew the song and dance. It had to do with time differences in China and India and the Middle East or somewhere else on the other side of the world. “I was hoping you’d return my call today.” The moment she said it, Grace wished she could take it back. She didn’t want to sound like a nag. Beeping in her ear cut her off. The line went dead. Grace held the phone out in front of her and just stared at it. Argh. Good thing she was going home this weekend. She and Roger needed some real time together, not these frustrating long-distance calls. Grace didn’t answer. It had taken her an hour to fall asleep and she still felt exhausted. “Thanks.” It came out as a croak. Grace laughed and dropped into a pew to wait until Barry was satisfied with amps, plugs, wires, lights, and tune-ups—all the mysterious details that had to be cared for before she stepped out on stage. How serendipitous that her Denver-based booking agency—Bongo Booking—had rounded up this gem of a garage band in Chicago, her hometown, and hired them to tour with her. No, that wasn’t serendipity—it was a God-thing. Their sound and her voice had fit like the proverbial hand in glove, and the guys were fun to work with too. She watched and listened, amused, as Petey, the saxophonist, shaved head glistening, jammed with red-headed Alex and his electric guitar. Hefty Reno, the keyboardist, was still pushing amplifiers around, while Nigel—ponytailed and tattooed—set up his drums, and Zach, sporting his “African knots” hairstyle proudly, joined the jammers on his electric bass. Her fingers itched to take out her cell and try Roger again before things got busy … but she resisted. No, he’d promised they’d talk tonight. Maybe he could still get a flight to Memphis tomorrow and take in her last concert. “Grace! We’re ready!” Barry called from the front. She smiled to herself as she headed down the aisle. Tomorrow, hopefully, she’d sing for Roger too. 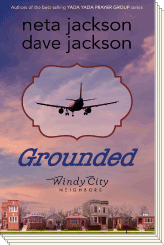 Grounded—available May 2013, preorder now. To receive an email announcement whenever a new book by Dave or Neta is released (only three or four times a year—we won't bug you), click HERE to sign up.